The bright, colorful graphics are what attracts the eye, but what we love most about Graze Organic lunch totes is that they are practical – as in throw them in the washing machine practical. Made from durable, pre-washed, organic cotton canvas, Graze Organic lunch totes are generously sized to hold plenty of waste-free food containers, reusable bottles and healthy snacks. A Velcro closure keeps everything tucked safely inside. 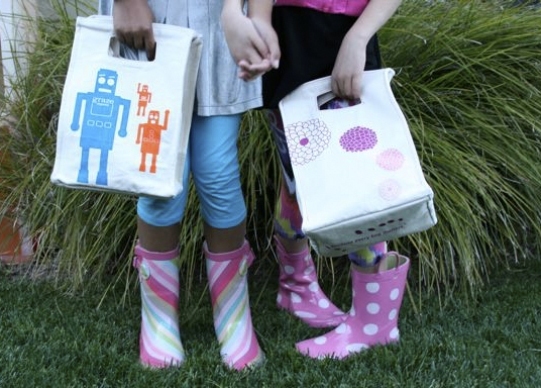 Adorable graphics of flowers, robots or the classic “because every bag matters” design are silkscreened on the front, back and bottom of the bag using eco-friendly water-based inks. Best of all, when your child comes home from day camp or school, just throw the bag straight in the washer and dryer and say goodbye to stinky, hard to clean lunchboxes! The bright, colorful graphics are what attracts the eye, but what we love most about Graze Organic lunch totes is that they are practical - as in throw them in the washing machine practical. Made from durable, pre-washed, organic cotton canvas, Graze Organic lunch totes are generously sized to hold plenty of waste-free food containers, reusable bottles and healthy snacks. A Velcro closure keeps everything tucked safely inside. Adorable graphics of flowers, robots or the classic "because every bag matters" design are silkscreened on the front, back and bottom of the bag using eco-friendly water-based inks. Best of all, when your child comes home from day camp or school, just throw the bag straight in the washer and dryer and say goodbye to stinky, hard to clean lunchboxes!